Faced with a lovely 3 day weekend, I decided to tackle a cake experiment. Covering a cake with rolled fondant. Yikes. I had numerous issues with this cake, but overall I’m happy with my first attempt. My husband says it looks like a 4th of July cake. Yes, I suppose it does, but Memorial Day is a patriotic holiday too! I used my standard yellow cake recipe (Wilton’s) and substituted lemon extract for the vanilla extract for a lemon flavored cake. Note: overfilling cake pans is a very, very bad thing. I used two 6″ round pans and filled them to about 3/4 full and they rose and spilled on the bottom of my oven. Hot mess. But, the cakes came out in one piece (sort of) and they were delicious, so no serious harm done. Next I made up a batch of buttercream icing (Domino’s recipe) and again replaced the vanilla extract with lemon extract. I also added the zest of one lemon. I was planning a raspberry filling – just seedless raspberry jam. When it came to filling and icing this cake, I had the same problem I had the last time I made lemon raspberry cake: raspberry jam is very slippery. 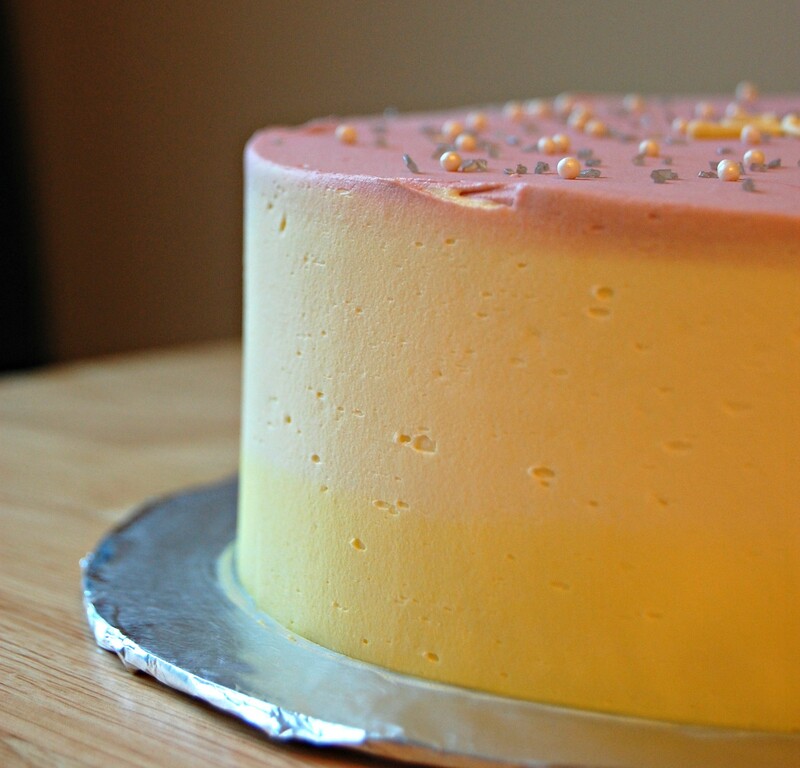 I did pipe a ring of buttercream around the filling to keep it in the middle, but it did leak out the sides a little. Had I not been planning to cover the whole thing in fondant, I would have been angry – it was looking messy! But, because I planned to cover it all up, I didn’t have to worry about crumbs in the frosting, etc. After frosting it, I popped it in the freezer for a few minutes. When I took it out it was much easier to smooth the sides and get a flat (ish) finish. I used Wilton’s ready-made fondant for this. I used about 1 package (24 oz). I tinted most of it blue, and then a smaller part red, and left a tiny part white. With the red and white, I cut out some stars with cookie/fondant cutters and skewered some of them on lollipop sticks. Next came rolling out the fondant. This took 3 attempts. I dusted my counter top with powdered sugar and rolled out the fondant to about a 16″ circle. I lifted it over my cake and it cracked around the edges. 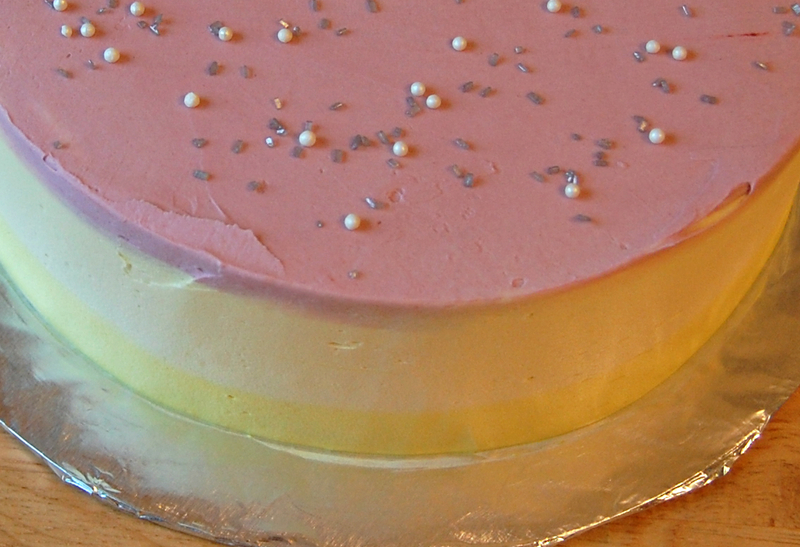 So I took it off, put the cake back in the freezer, and headed to the interwebs to find out what to do. I read tips about using shortening to fix cracks and using cornstarch to dust the work surface (especially in a humid climate – and today its VERY humid!). I rolled it out again and it was better – much less dry. But I tore it. So onto attempt 3. One more time and it seemed to be working. I lifted it over the cake and it didn’t crack (as much). I smoothed the top and sides with a fondant smoother and my hands and it was working pretty well. Except for the folds on the sides. I wasn’t sure how to get rid of them. Should I cut them? (No.) I think my fondant was still a little dry so it wasn’t standing up to the stretching that it should have. I assume that a little stretching would have smoothed out the folds. Luckily I was planning to cover the cake with fondant decorations, so the imperfections were covered!! 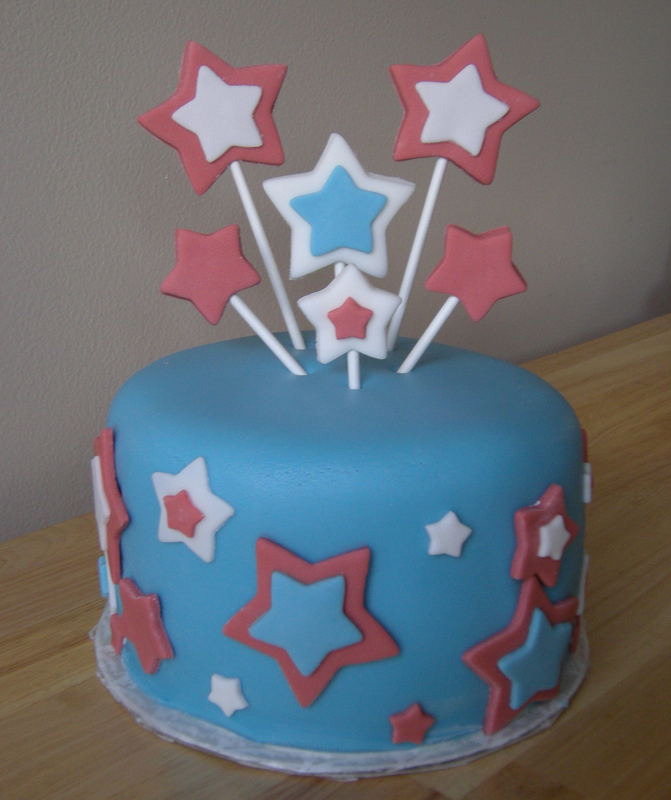 I attached the stars to the cake with water. I brushed a little onto the back of the stars with a tiny paintbrush and that seemed to work. You are currently browsing the archives for the Lemon category.